Last year, Big Ears kicked off with nief norf (more on them soon) performing Michael Gordon’s composition “Timber”, a piece for six percussionists playing amplified 2×4 pieces of wood with mallets. It was one of the great surprises and thrills of the festival. It’s a terrific piece, hypnotizing and thrilling at the same time. This year, nief norf is back (they are based in Knoxville at UT) and Bang on a Can is bringing it as well. But that’s for another post. Hidden among the riches in the 2018 Big Ears schedule is the Rushes Ensemble on Saturday from 2-3 p.m. at the Knoxville Museum of Art. Now strangely, there is no mention of Rushes Ensemble on the festival lineup page, so they might be easy to miss. Don’t. Miss them, I mean. 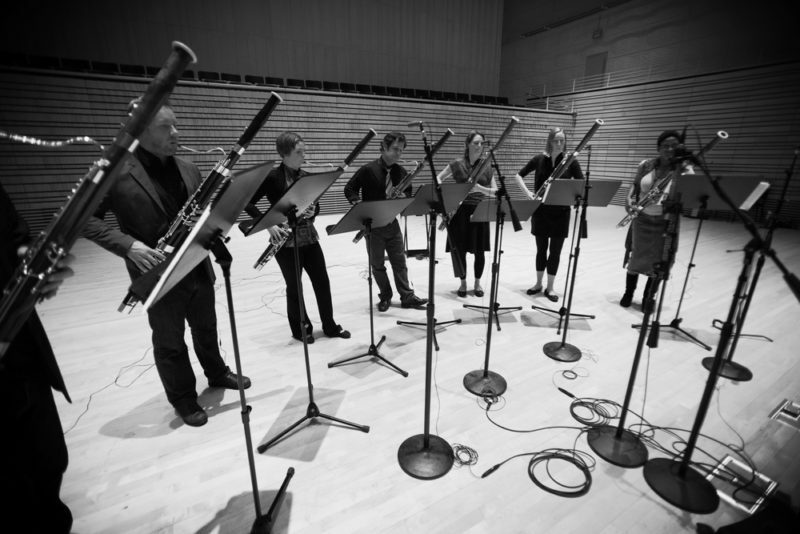 Rushes is a group of seven of the best bassoon players in the world. That alone is enough to pique interest, but their entire raison d’etre derives from a commission that led Michael Gordon to write a piece specifically for…yep…seven daggum bassoons. It is hard to describe. The music takes much from Steve Reich’s pulsation methods, and while the overall effect is of something like a Fripp Soundscape – all washes and gorgeous drone – the ensemble is playing to a click track to ensure that the pulsations are overlapping precisely. Eventually, overtones begin to build that create illusions of instruments that are not actually there. I’ve experienced this effect before as both a musician and an audient. It is one of the rare and wondrous physical manifestations of music. The impact on deep listeners can be profound and emotional. It is both gentle and not for the faint of heart. You can dig around on YouTube and find a performance of this piece by this group. I say, don’t do it. Just turn up Saturday afternoon and experience this for yourself in the acoustically lively atrium of the museum. This could well be the hidden gem of the whole danged festival. You heard it here first. i2b never sleeps.